During its long history Wroclaw has also been variously known as Wrotizla, Vretslav, Vratislavia, Presslaw, Bresslaw, Breslau, Bressla, Presslau, and Bresslau. Archeological excavations suggest that this area was probably first settled around 900BC to 800BC. From 990AD the area is known to have been under the control of the Polish kingdom. The town, then called Wratislavia, is first mentioned about 1000 when the bishopric was founded by King Boleslaw the Brave. In 1109 Emperor Henry V invaded Poland and was defeated by the Polish king, Boleslaw the Wrymouth, at Wroclaw, the battlefield became known as Psie Pole (Dogs’ Field) and the name remains to this day as one of the districts of Wroclaw. The reason why this was so called is that following their defeat the Germans ran leaving their dead and their injured to the stray dogs in the area. The death of Boleslaw the Wrymouth, in 1138, saw the creation of the duchy of Lower Silesia with the city of Wroclaw as its capital. In 1259 the duchy joined the Hanseatic League and its Bishop became a prince of the Holy Roman Empire ruling over this area. In 1335 the duchy of Lower Silesia was annexed by the Bohemian king, despite desperate attempts by Kazimierz the Great to regain it for Poland. A contemporary chronicler wrote that “it would return to the Polish people when God once again took pity on them”, and that took place in 1945. In 1463 the city of Breslau placed itself under the protection of Pope Pius 2 and a few years later it came under the rule of the Hungarian King, Matthias Corvinus. Following his death, in 1490, the city again came under the rule of Bohemia. It then passed to the Austrian Hapsburgs in 1526 when Ferdinand was chosen king of Bohemia. 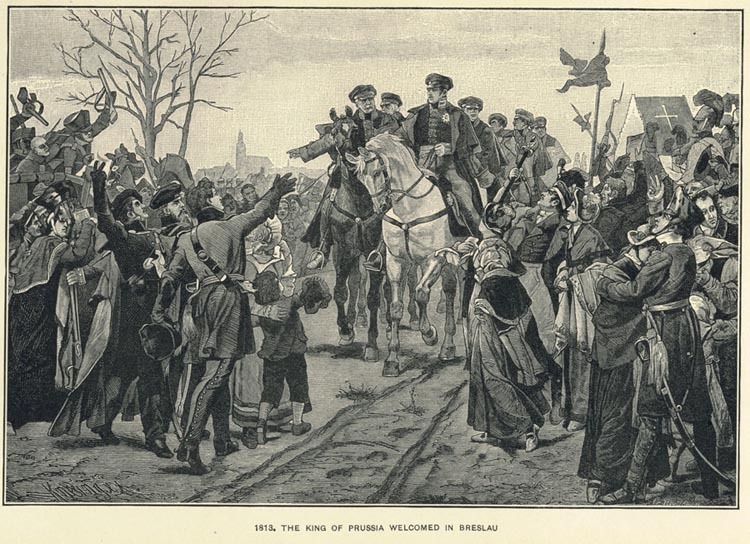 The King of Prussia being welcomed in Breslau in 1813. 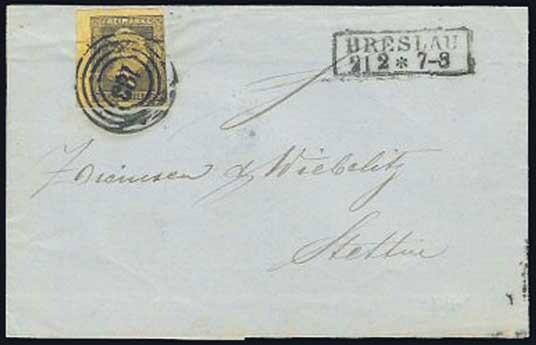 In 1741 the duchy of Lower Silesia together with the city of Breslau became part of Prussia and subsequently Germany. For a brief period of a few months in 1757 it was captured by the Austrians and for two very short periods, of only a few days, in 1807 and 1813 it was held by the French. 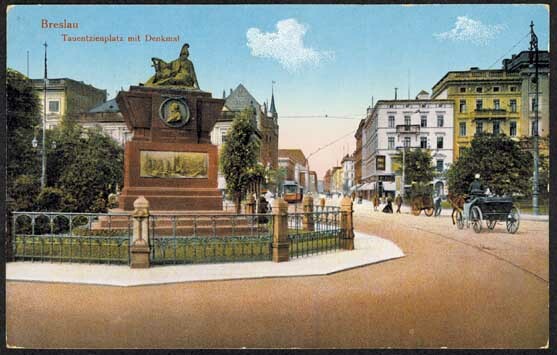 During the 1800’s Breslau grew rapidly with the Industrial Revolution to become one of the largest towns in Germany. Being so far inland Breslau was considered by many Germans, during World War 2, as an "Air-raid shelter of the Reich". This created such an influx into the city that by late 1944 the population was nearly one million. In September 1944 Hitler declared Breslau a fortress, "Festung Breslau", numerous fortifications were built around the city and supplies were stockpiled for a long term encirclement in anticipation of the Russian advance. As news of the Soviet advance reached the city in January 1945 the civilian population attempted to flee the city. The German Army command did not permit any evacuation till the 20th January 1945 when groups, of 60,000 people per day, were allowed to leave the city on foot in temperatures of -10°C. This resulted in numerous deaths amongst the children, the old and the infirm. Countless bodies littered the routes the people took out of the city. It has been estimated that 90,000 civilians died during this evacuation of 700,000 people. Many of the evacuees made their way to Dresden, where they again had to suffer, a large number of them were killed in the Allied bombing of Dresden which started in mid February 1945. Some 200,000 Breslauers remained in the city together with the garrison of some 45,000 troops. The Soviet attack commenced on the 8th February 1945 and by the 15th February the Soviets had completely ringed the city. The Germans defended Breslau for nearly 4 month before surrendering on May 6th, just one day before the final surrender by Germany. This defence cost the lives of 30,000 civilians, 6,000 German soldiers and 8,000 Soviet soldiers. The remaining 40,000 German soldiers were taken into Soviet captivity, very few of whom ever returned. The city was in ruin, of the original 30,000 buildings in the city over 20,000 had been completely destroyed, the remainder were damaged but useable. 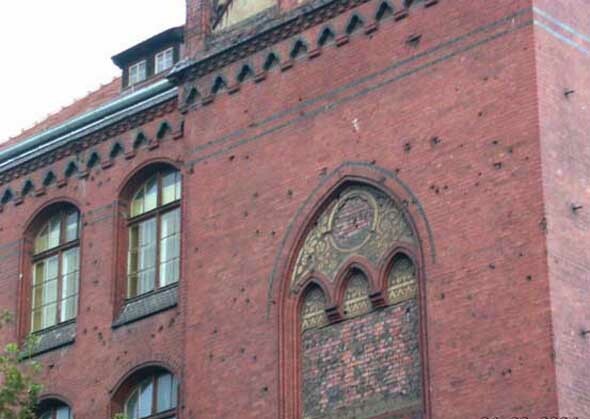 To this day most remaining pre war buildings in Wroclaw show scars of the fighting in 1945. On the 9th May the Soviets installed a Polish City Council to run the city. At the Potsdam Conference, which ended on the 2nd August 1945, it was agreed for the area to be placed under Polish administration pending a peace settlement. After a gap of over 600 years the city was returned to Poland and rechristened Wroclaw. 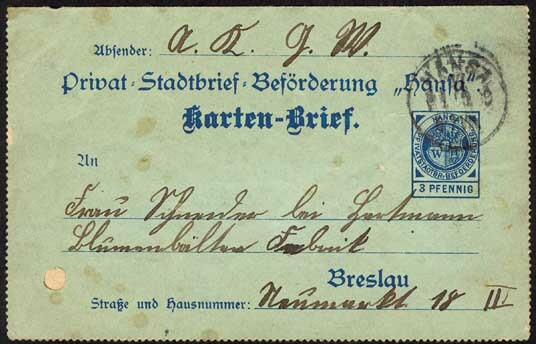 The remaining German citizens were relocated westward soon after the war and Polish citizens from the Lwow area (formerly in Poland, now in Ukraine) were transported to Wroclaw. The immediate post-war population of Wroclaw was reduced to nearly a quarter of the prewar figure. Records show that by 1387 the merchants in Wroclaw had organised a private post with regular foot messengers going to Legnica, Brzeg, Opole, Nysa, Prague, Kalisz and Gdansk. The City Council was involved in producing regulations regarding the messengers, the oldest of these regulations is known from 1542 when the council set the maximum rate to be paid to messengers. 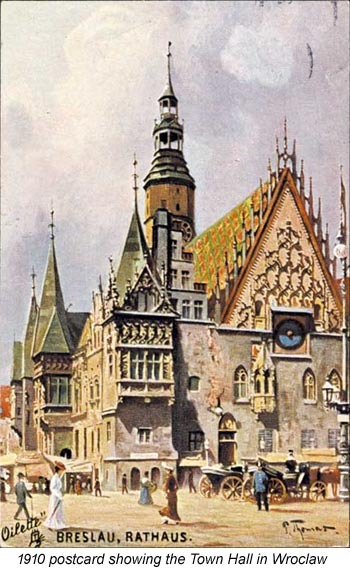 By 1573 there were some 40 messengers in Wroclaw with their own office next to the Town Hall. This office became in effect a "Post Office", where letters and money could be handed in for onward transmission and letters could be collected. The first mention of a messenger service between Wroclaw and Berlin is in the year 1614. At about this time the journey Wroclaw - Poznan - Torun - Gdansk took 8 or 9 days in the summer and 11 days in the winter. Up to about this time most of the messengers travelled by foot. In 1650 the post by horse between Wroclaw and Leipzig took 5-6 days. The first post by horse to Prague was organised in 1652 when the journey took 4 days. 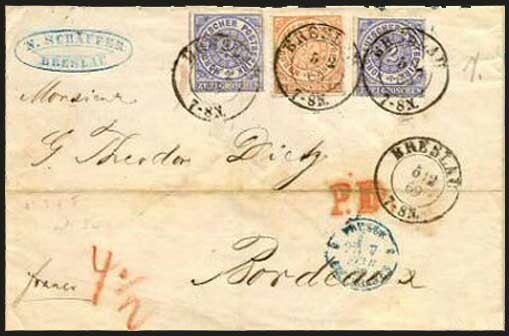 Gradually control of the post passed from the city to the Duchy and by 1722 the postage rates were being set by the duchy. 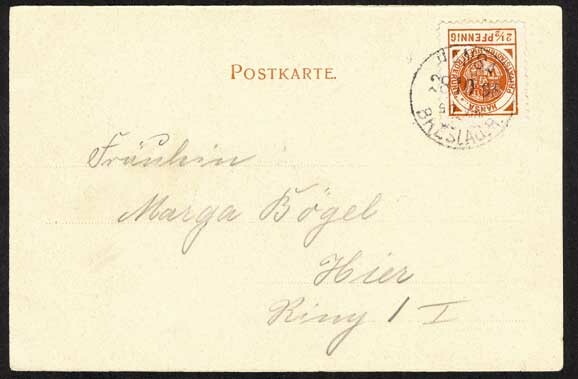 When in 1741 the duchy became part of Prussia the post then came under the control of Berlin. Following the German surrender on 6 May 1945 the first post office, under Polish administration, to be opened in Wroclaw was on 16 May 1945, just 10 days later. By the end of 1947 there were 14 post offices open in Wroclaw. From its central location there were numerous railway routes from Wroclaw. 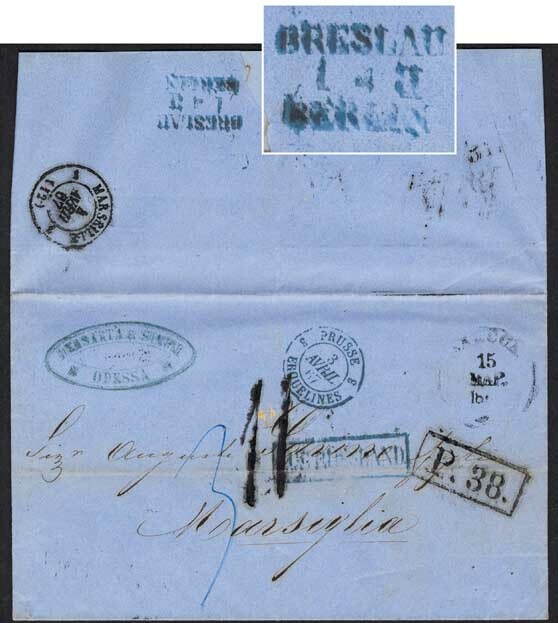 A total of 10 different companies operated a private post in Breslau between 1867 and 1900. 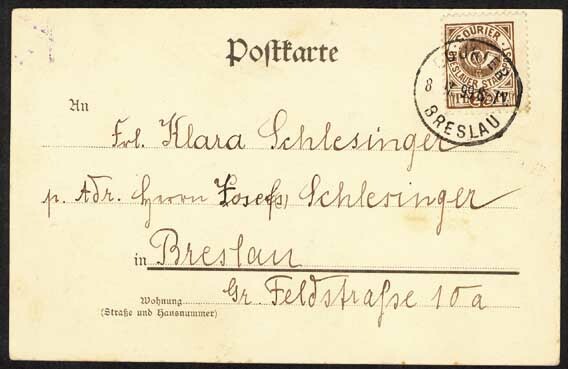 Full details of these private posts in Breslau may be found in "Die Deutschen Privatpost-Anstalten, Band II" by Hans Meir zu Eissen.